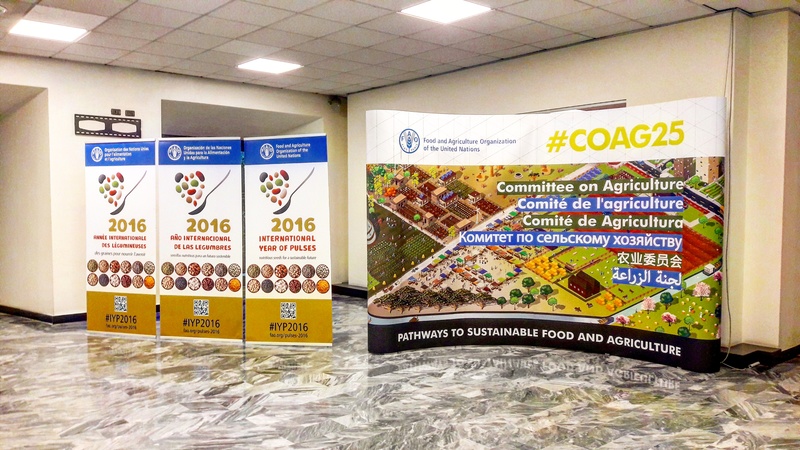 25th Session Committee on Agriculture (COAG) was held in Rome at FAO from 26 - 30 September 2016. The EU Delegation in Rome together with colleagues from Brussels participated. 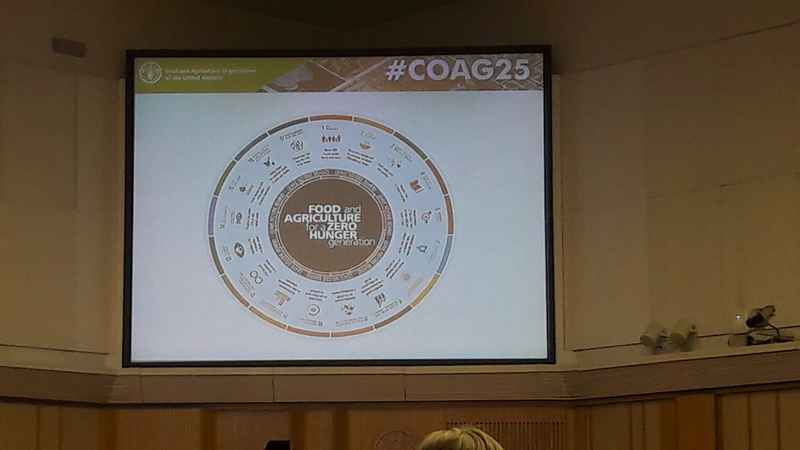 The Committee on Agriculture (COAG) held its 25th Session from 26 to 30 September 2016 at FAO Headquarters in Rome. Chaired by Mr Joseph Sam Sesay (Sierra Leone), the Committee was attended by 115 Members of the Committee, including 7 Ministers. Moreover, 5 Members of the Organization, the Holy See, Palestine, the Sovereign Order of Malta, 3 United Nations Organizations, 5 Intergovernmental Organizations and 7 Non-governmental Organizations participated as observers. The EU was proactive and visible throughout the COAG week. The EU Delegation in Rome and Mr Javier Alcazar Sirvent of the Directorate-General for Agriculture (European Commission) attended the Committee. Three Keynote speakers addressed the opening ceremony: FAO Director General, Mr José Graziano da Silva, Honourable Monty Patrick Jones (Minister for Agriculture, Forestry and Food Security) speaking on behalf of Ernest Bai Koroma (President of the Republic of Sierra Leone), followed by Professor Joachim von Braun (Director of the Centre for Development Research in Germany), who strongly underlined the importance of world’s agriculture and food transformations, sustainable development goals and innovation. One of the core issues was the development of the FAO Corporate Climate Change Strategy, encompassing issues relating to biodiversity, exploring synergies between adaptation and mitigation, as well as fostering collaboration among countries. Members focused their discussion on Antimicrobial Resistance (AMR) and encouraged FAO to carry on its collaboration with the WHO, the OIE and other relevant stakeholders, in order to implement UN Declaration on antimicrobial resistance through strengthening national and regional capacities and using One Health and multi-sectorial approaches. Acknowledging the huge importance of nutrition, the Committee encouraged countries to mainstream it into national and regional agricultural policies and programmes, including through South-South Cooperation, paying particular attention to relevant outcomes for agriculture and livestock development. The Committee welcomed the Finish proposal for a World Bee Day (to be celebrated on 20 May of each year) and of the International Year of Plant Health (IYPH) and supported the principle of establishing an International Year of Camelids. 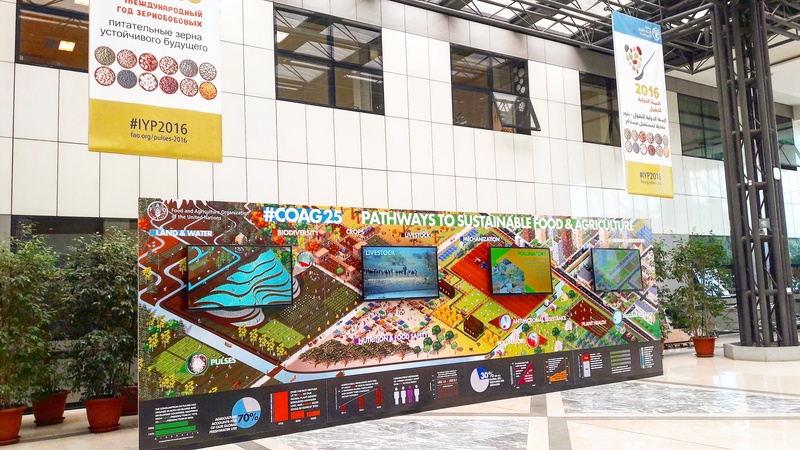 Nine side events were organized by a wide range of stakeholders, and during the whole week a "Speakers' Corner" was held in the Atrium with the participation of FAO experts, who provided an interactive opportunity to find out more information about the themes.